Dust extraction specialists, Dustcontrol UK, have been awarded the Speedy Health & Safety Award for their ‘DC 2900’ industrial mobile dust extractor. The company was presented with the Award at last week’s T2VIPlive Awards Ceremony, hosted by Simon Briggs from Speedy and The Gadget Show’s Pollyanna Woodward. The ceremony took place after the first day of the T2 VIPlive show, at the Telford International Centre, which attracted over 1,300 visitors. T2VIPlive is organised by Speedy, the leading service provider offering equipment for both hire and sale. 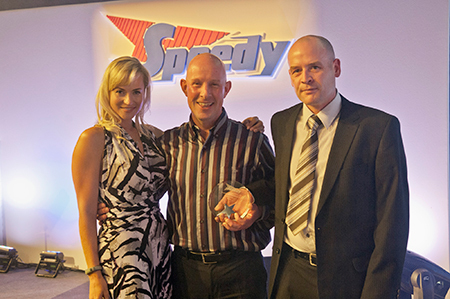 Martin Knott, Speedy’s Director of Business & Customer Excellence, presented the award. Coupled with a suitable suction casing, the DC2900 can reduce dust emissions by almost 100% in some cases and since it is also a great vacuum cleaner too, it is a perfect alternative to site sweeping. Design standard to Application Class H with Hepa13 filtration, cyclone separation, an open inlet flow of 190m3/hr, and a strong performance curve, the machine is simple to operate and maintain and demonstrates a no compromise approach to reducing airborne dust levels on construction sites. Phil Haskins, construction sales manager at Dustcontrol UK, and who accepted the Award, commented: “With the DC2900 users can get on with their work efficiently without disrupting others and creating pollution; sweeping can effectively be banned since the vac will do it just as well and not create more airborne dust during the process. Collected dust is securely contained in the vacuum unit, discharged to the easy to change bag at the bottom and filtration is Hepa 13 with 99.95% separation of dust at 0.3 micron. Indeed, The DC2900 caught the eye of the judges through its innovative design, which allows it to remove dust from the source of its production and effectively contain it using cyclone technology. 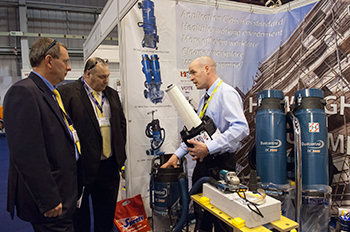 The pleated cartridge Hepa 13 filtration also impressed the judges, as filters can be cleaned without removing them, resulting in virtually dust free bag changes.